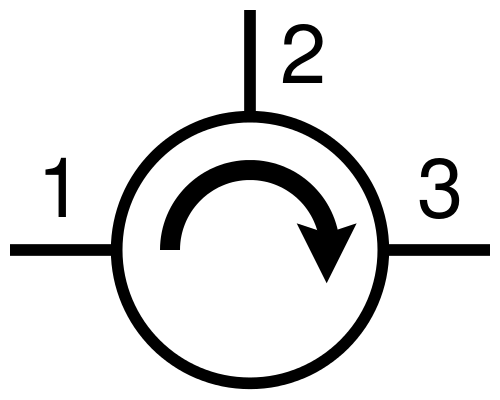 Circulators are a bit like traffic circles (also known as rotaries or roundabouts), where motion occurs in one direction only and each pathway doubles as an entrance and exit. In a circulator, however, the microwave signal always exits at the next available port. This characteristic makes circulators useful for applications that involve coupling transmitters and receivers to common antennas. 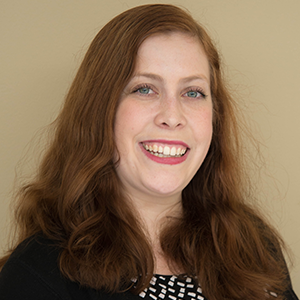 To ensure that circulators function successfully, electrical engineers can study their designs with electromagnetics simulation. Microwave circulators are nonreciprocal multiport devices that often contain three ports in a “Y” shape. In a circulator, a wave incident originating in one port can only be coupled to the next port. Due to this functionality, electrical engineers use circulators to isolate microwave components. A simple schematic of a circulator. Image by Geek3 — Own work. Licensed under CC BY-SA 3.0, via Wikimedia Commons. One common application of microwave circulators is a duplexer, where a circulator enables a transmitter and receiver in a radio communication system or radar unit to share a common antenna while still isolating the receiver from the transmitter. To build a circulator, engineers often use anisotropic materials like ferrites due to their high electrical resistance and high magnetic permeability. However, the choice of material can affect how a wave propagates between the circulator’s ports. 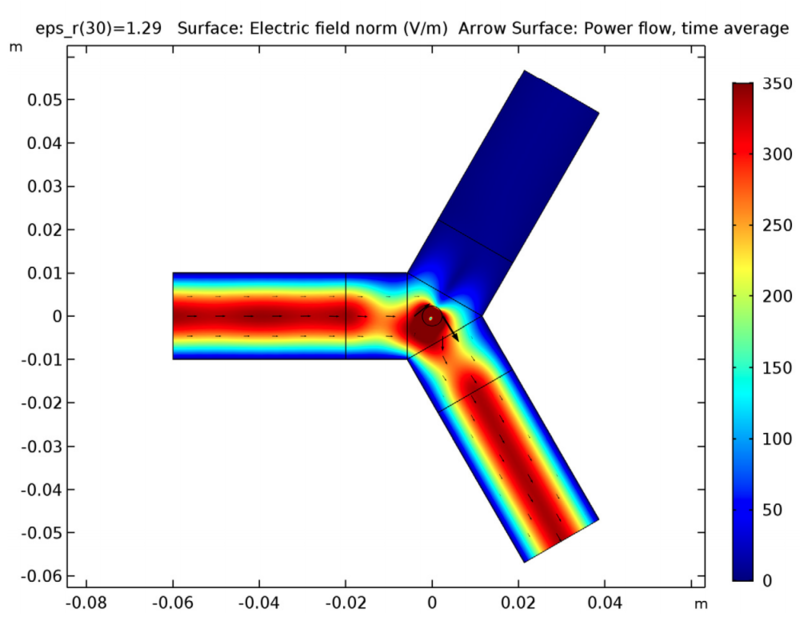 In this example, we use the RF Module, an add-on to the COMSOL Multiphysics® software, to accurately analyze both the ferrite material and the inner workings of the circulator. The lossless three-port ferrite circulator example shown below is made from three rectangular waveguide sections joined at 120° angles. Within each branch, identical dielectric tuning elements are used to match the junction. 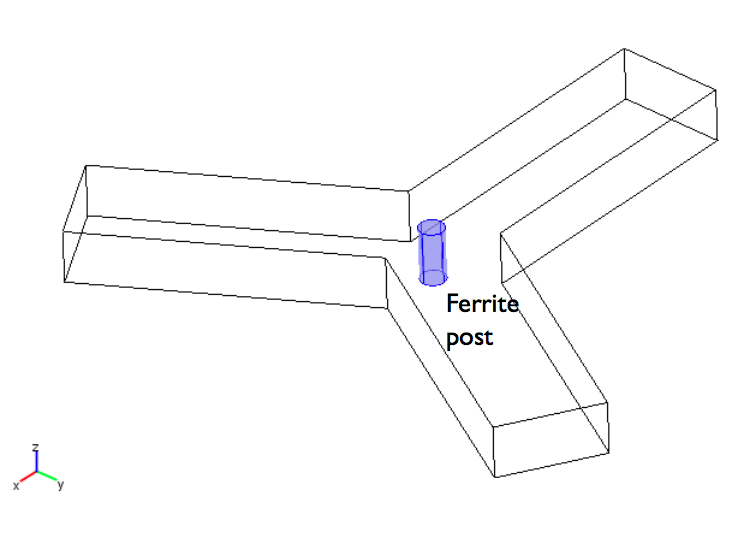 A ferrite post is placed at the center of the joint and is magnetized by a H0 bias field along the axis. The model analyzes the transmission of a 10-GHz TE10 wave through the circulator. Since a TE10 waveguide mode has no variations in the transverse direction, it’s possible to simplify the analysis with a 2D model. 2D circulator geometry with dielectric tuning elements. One design goal for circulators is to reduce reflections at the input port by matching the junction. To match the junction, it’s necessary to determine how well the TE10 wave propagates between the three ports for various tuning element materials. You can do so by finding the S-parameters (which measure the transmittance and reflectance of the circulator) in relation to the tuning element permittivity for the fundamental TE10 mode. Does This Ferrite Circulator Design Function Properly? Using the RF Module, you can run an S-parameter analysis of the circulator device. The graph below compares the relative permittivity of the dielectric matching elements (eps_r) with the S11 parameter, which relates to the reflection coefficient at Port 1 (the input arm). 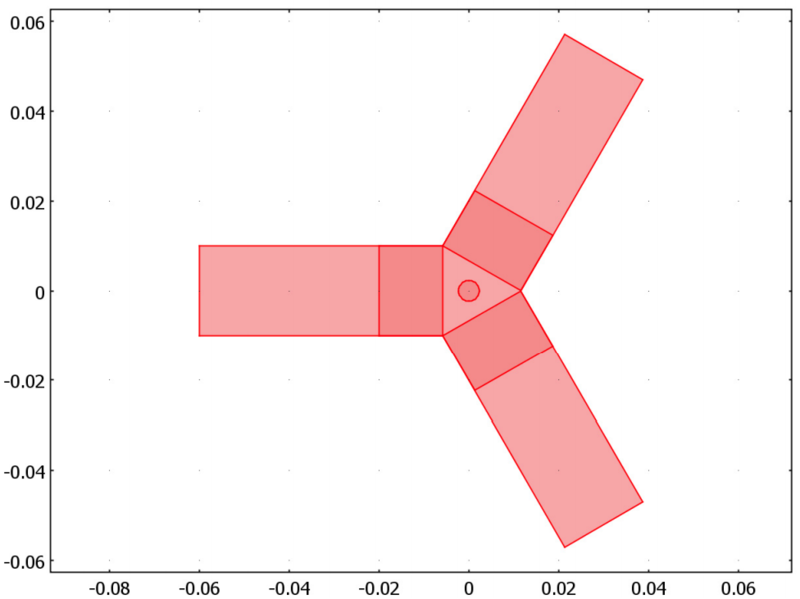 This result shows that a minimum reflection is achieved at around eps_r = 1.29. S11 parameter vs. relative permittivity. In the next plot, take closer look at the eps_r value of 1.29. You can use this value to find a reflection coefficient of around -35 dB. This is a good value for circulator designs. Electric field norm and power flow in the microwave circulator. As you can see from the power flow arrows in the plot above, the microwave energy flows in one direction from port to port, as desired. In addition, there are no standing wave patterns in the magnitude plot of the electric field. Based on these findings, we can conclude that this circulator design behaves as expected. Using electromagnetics simulation, electrical engineers can move forward in their microwave circulator design processes. 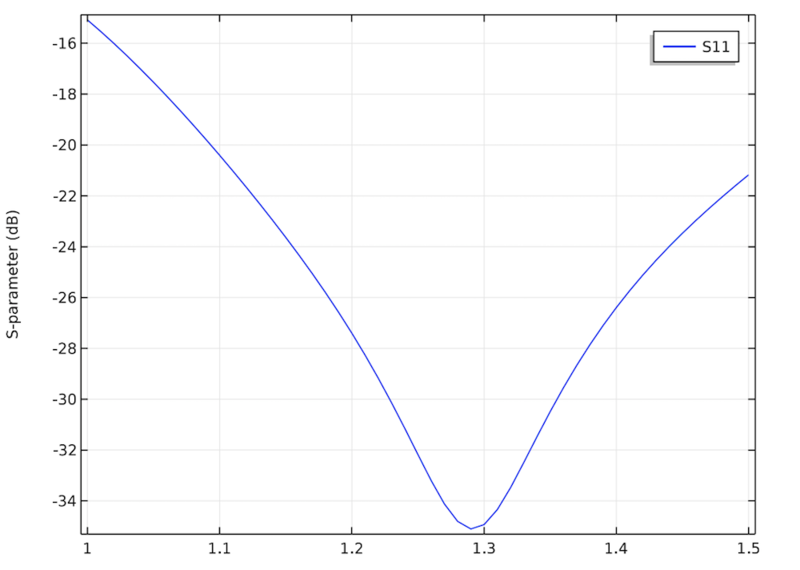 To give this microwave circulator example a try, click on the following button. This will take you to the Application Gallery, where you can get detailed modeling instructions and the MPH-file (please note that this requires a valid software license and COMSOL Access account).